Here are some Great Lucy Links that even Everything Lucy enjoys! Don't see your special Lucy-Related Resource or know of one that should be added? Let us know! The Official Blog for Everything Lucy. The only source for constant news and information on Lucille Ball. The Official Lucille Ball, Desi Arnaz Center and Museum in Jamestown, NY. Helping to preserve and celebrate the legacy of Lucy and Desi. The Official Website of Lucille Ball's daughter, Lucie Arnaz. 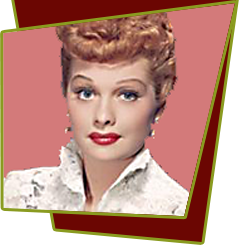 The Official Website of Lucille Ball's son, Desi Arnaz, Jr.
A Webzine run by Tom Watson celebrating Lucy for Lucy fans and collectors. News updated every week! A resource for Lucille Ball information and fun! An online tribute to Lucille Ball, Desi Arnaz and "I Love Lucy". A website discussion forum on anything related to Lucille Ball. This is one of the best resources for discussion on the internet! Fan website of Glen Charlow, a major Lucille Ball collector. Old Time Radio on MP3. Extensive collection of comedy, music, mystery, and more.